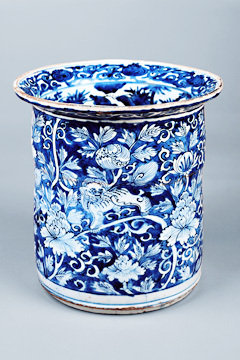 This decorated water jar features an underglaze of cobalt blue. CHINA'S 17th century Ming dynasty during faced major upheaval, as peasants rose up against corruption and heavy taxation, and Manchu incursions commenced. With much of the imperial court's wealth applied toward the military, Chinese artists faced survival challenges and were forced to explore new ways to sell their works. In Jingdezhen, foreign trade emerged as a means to make up for imperial patronage, and potters in particular found Japan an eager consumer of porcelain ceramics. This new relationship also allowed Jingdezhen artists newfound freedom in their artistic exploration: Japanese aesthetics were dramatically different from those of their own country, and the potters began to experiment with new techniuqes and designs that would have failed to appeal to imperial tastes. 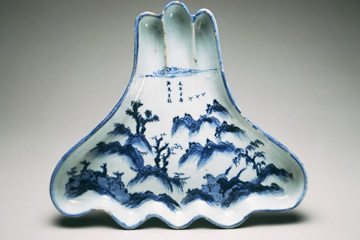 This fancy-shaped dish is part of "Trade, Taste and Transformations: Jingdezhen Porcelain for Japan, 1620-1645," an exhibition at the Honolulu Academy of Arts. 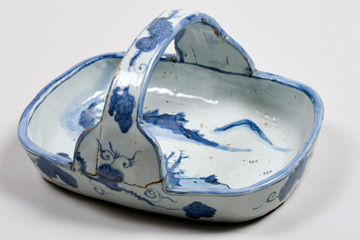 "Trade, Taste and Transformation: Jingdezhen Porcelain for Japan, 1620-1645" exhibits some of the pieces from this era. The Honolulu Academy of Arts is showing more than 100 works, many rarely seen outside Japan. Items include incense boxes, vases, water jars and charcoal burners, as well as bowls and plates, the standard porcelain pieces. 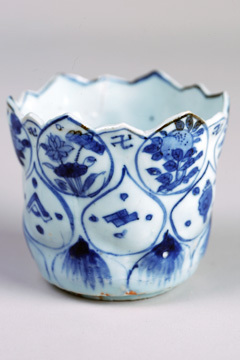 The pieces illustrate the Japanese love of blue and white juxtapositions, asymmetry and imperfection, with edges of pieces "moth-eaten," where the glaze flaked as a result of a firing technique. Painted decorations melded popular Chinese and Japanese motifs, including landscapes, animals and textile patterns. "Trade, Taste and Transformation" runs Thursday through Oct. 8 at the Honolulu Academy of Arts, 900 S. Beretania St. Museum hours are 10 a.m. to 4:30 p.m. Tuesdays to Saturdays and 1 to 5 p.m. Sundays. Admission is $7 general, $4 seniors, students 13 and over and military; free to children 12 and under. 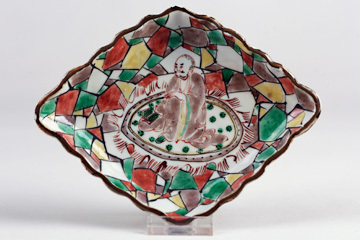 Diamond-shaped dish decorated in polychrome enamels. Basket, and bowl, below, with an underglaze of cobalt blue.